- Strategy derived from the War of 1812 necessitated adequate coastal fortifications, or so at least it was perceived. The result was a plan for 50 forts from New Orleans to Maine. It reached Monroe County in 1845 in the form of two huge brick forts, Fort Jefferson on Garden Key in the Tortugas and Fort Taylor just off of Key West. This was the first major federal construction project since Commodore Porter built the naval depot. Fort Jefferson and Fort Taylor were started almost together, however due to its remote location, Fort Jefferson had different delays. At the time, and perhaps still is, Fort Jefferson was the largest brick fortification the US had. Over 44 million bricks were used for its construction and it spread over 16 acres. 109 water cisterns were built for about 1,500,000 gallons of water. 'Fort Jeff' is about 70 miles west of Key West. Also like Fort Taylor, Fort Jeff was not completed in time for the Civil War. It was garrisoned in 1861 and remained in Union hands, but it appears not to have been as useful as Fort Taylor was. The story goes that about the only encounter it had was when a Confederate ship entered the harbor and demanded the fort's surrender. The Fort's commander, Major Arnold, replied to the Confederate messenger, "Tell your Captain I will blow his ship out of the water if he is not gone away from here in ten minutes." The bluff worked and Fort Jeff never fired a gun in action during the war. The debate continues as to the effect had it fallen to the Confederates and Fort Taylor remained with the Union. The fort is probably better known as a Civil War prison where Dr. Samuel Mudd was incarcerated following his conviction as a party to the assassination of President Lincoln. John Wilkes Booth broke his leg jumping off the stage after shooting the president on April 14, 1865. Dr. Mudd treated the wounded actor, but maintained he was not involved in the conspiracy. Dr. Mudd was sentenced to life at a military trial on June 30 and sent to Fort Jeff in 1865. President Andrew Johnson pardoned Dr. Mudd in 1869. An inscription over Dr. Mudd's cell reads, "Abandon all hope ye who enter here." When war with Spain loomed in 1898, the Army turned over control of Fort Jeff to the Navy for a coaling station. The Spanish American War was short and the coaling operations ceased in 1901. After damage from the hurricane of 1906, the fort was abandoned. Incidentally, the World War-I veterans who died in the 1935 hurricane in the Upper Keys were originally scheduled to work at Fort Jeff. One reason for their diversion to build ferry replacement bridges in the Upper Keys was that negotiations with the Navy for a National Park was slow in accomplishment. Fort Jefferson is a national monument in the Dry Tortugas National Park. For a look at early life at Fort Jefferson, CLICK HERE, use the back arrow to return. Fort Zachary Taylor is discussed also on the Key West web page. The fort was built some 1,200 feet offshore as an island. A complex foundation was built and the walls rose some 50 feet above the water. A drawbridge connected the fort to the mainland. Forty-water cisterns were built to store 750,000 gallons of potable water. As with Fort Jeff, many of the master masons were from Ireland and Germany. The high vaulted ceilings and complex arches required master skills. The Great Hurricane of 1846 wreaked havoc from Key West to Indian Key. Both lighthouses at Key West were destroyed and the city's structures badly damaged. The newly started fort was particularly set back from the hurricane, then it was yellow fever's turn. The 'fevers' were a yearly threat during each summer. Years 1854, 1856 and 1862 were unusually bad hurricane years. In 1847, a new industry lurched into action - sponges. Already established from the Bahamas, New York welcomed the high quality sponges gathered from the waters of the Keys. At the outset of the Civil War, Florida was a confederate state and it was expected that Monroe County would be also. The Union had a considerable force in Key West because of the construction of Fort Taylor under Captain E. B. Hunt (Corps of Engineers). Key West was taken easily on the night of January 13, 1861, when Captain James Brannan took possession of the city while it slept. Key West played a major role during the war because of it strategic location. Key West became the center for the Union's Gulf and East Gulf blockading forces. Many ships from many nations were seized and brought into Key West's harbor for disposition. Records reflect about 300 Confederate blockade runners seized and held. The two Martello Towers were always planned to thwart a land attack and work finally began. Key West was also the logistic support center for Fort Jefferson. Fort Taylor is now a state park. Key West's population increased 400 percent in the 1840s decade. In addition to wrecking and sponging, the construction of Fort Taylor (1845) and Fort Jefferson (1846) had began. Considerable numbers of slaves were brought in to be 'rented' for construction of the forts. During the 1840s decade the slave population increased 653 percent. Not to be forgotten is that the cigar industry was in its infancy. The Civil War was largely responsible for Key West becoming Florida's largest city. Key West profited while other southern cities were being reduced to rubble. Jacksonville was its closest competitor and while it was not destroyed, it was set back considerably. In the 1890s it had to incorporate almost all of Duval County to edge Key West out in population count. I cannot say for certain if Monroe County existed in more than name only during the Civil War. Florida seceded from the US on January 11, 1861. On January 13, 1861, the Union seized Key West which was also the seat of County Government. Florida joined the Confederate States on January 18, 1861. Maj. French of the Fifth US Artillery took command for the Union on April 6, 1861. The Union suspended all Florida officers on May 17, 1861. Maj. French refused to allow any judicial of magisterial functions except those of the Union. In view of the above, we might wonder if there was a functional Monroe County from 1861 to 65, and even for a few years later. The answer I believe is yes for Key West, but will question how functional for all the county. County government was necessary if for no other purpose than to process property deeds. The clerk of the court, Mr. Crusoe, a southerner, left, but Thomas Boynton the US district attorney could have performed his duties. Records are few describing county functions from 1861 through 1865. Monroe County retrieved part of its original land back when the governor approved the Acts of 1866 bill on December 8, 1866. Dade County's present southern boundary was established starting "at the mouth of Broad Creek, a stream separating Cayo Largo from Old Roads [sic] Key, extending thence in a direct line to Mudd Point." By default, this returned the present Middle and Upper Keys to Monroe County with the county line between Key Largo and Old Roads Key. On the overland route, the northern boundary is at about Mile Marker 114 on highway US 1. The western boundary continued to extend northward to about Fort Myers. Information appears to be lacking to explain why Dade and Monroe Counties wanted this change. The Bill passed without controversy. The same year of 1866 marked Monroe County becoming the link to connect Cuba with the world. In 1858 the trans-Atlantic submarine cable went operational and a second cable laid that year. Cuba was linked to the US via a submarine cable to Key West then to Punta Rassa near Fort Myers. Both repeater stations were in Monroe County. Punta Rassa later became Lee County in 1887 establishing Monroe County's present boundaries. It is generally believed that the presence of the "fevers" as well as the heat and mosquitoes reduced the summer population of the Keys. Of the three only heat and mosquitoes remain and they are controllable by aerial spraying and air conditioning. An example of the "fevers", in by September of the summer of 1887, the Marine Hospital (1845 - 1943) reported that there had been 282 cases of yellow fever in Key West and 30 had died. In 1899, there were 1320 cases with 68 deaths. Of the "fevers" yellow, dengue, typhoid and malaria, malaria was the lesser. Dengue and typhoid were not as deadly. In 1899, there were 6,999 cases of dengue reported and no deaths. Supposedly they all began from three mariners living in an old cigar factory. I am probably incorrect but the last case of yellow fever in the state was 1905. Polio was the next serious threat in Key West probably due to improved drinking water treatment in the 1930s and the resulting loss of passed on immunity. The 1940s and 50s were bad years for polio outbreaks in Key West. A new industry was quietly ushered in. One of the prominent wrecking captains, a Captain Ben Baker, found a new go between while awaiting ship wrecks. He planted pineapples on Plantation Key and Key Largo in about 1866 and they thrived. A new industry was born and it was just in time as steam ships were becoming vogue. Steam ships were not wind dependent and steered better in all wind conditions than sailing ships, so they did not wreck as often. Also, the Lighthouse Service was placing more functional lighthouses along the reef, so the wrecking economy was on its way out. The market for pineapples was in the northern industrial states and ships began changing from wrecking to transporting pineapples and other Key's products. It was not just that simple as pineapples had to be at the market site within seven to ten days after harvesting. In the early days, unfavorable wind conditions spoiled many a shipment of pineapples. - Charcoal makers inhabited the Lower Keys. (see Big Pine Key) The Cates, Sands and Knowles homesteaded Big Pine and No Name Keys. - The huge Pent family populated the Key Vaca area. - The Pinders and Russells were well entrenched at Upper Matecumbe Key. - The Saunders and Roberts occupied Windley Key. - The Alburys, Adams, Pinders, and Knowles were on Plantation Key. - The Alburys, Lowes, Johnsons and Tedders were on south Key Largo. - The Alburys, Bakers, Bethels, Pinders, and Currys were in the Rock Harbor area. - The Pinders and Johnsons were in the Newport (Key Largo) area. - The Bells, Lowes, Russells and Pinders were in the North Key Largo area. In the Upper Keys, Benjamin Baker and Menendez Johnson established separate post offices on Key Largo, but they were short lived. Postal responsibility was passed onto Planter on south Key Largo. Sam Johnson and his family settled at Planter on the south end of Key Largo around 1880. The son, John Wesley, in 1891 opened a post office. With the only post office between Key West and the mainland, Planter became a focal point. It developed into a small community with a post office, store, school, church and five farms. Small settlements like Basin Hills, High Mangrove Point and Newport rose and fell. Government records reveal homesteads being recorded throughout the Keys in the 1880s. The unincorporated Keys were officially surveyed in the early 1870s and the Homestead Act of 1866 was finally applicable throughout the Keys. For a five dollar filing fee, up to 160 acres were available for proving of a claim. For an additional $1.25 per acre patented title could be had in six months. A trivia item for Monroe County is in July 1901 rural mail delivery began in Key West. Leaving the Keys for the mainland, Monroe County's southwest corner of Florida had had minor uses since Dr. Henry Perrine used Cape Sable for experimental plantings in 1839. Many military excursions were made in the area during the Second Seminole War. Reportedly, during the Civil War Key West was over run with refugees and others, so food was very scarce. The powers that be in Key West sent farmers to the Cape Sable area to grow food. This could have occurred also in the Upper Keys and led to the farming of pineapples. 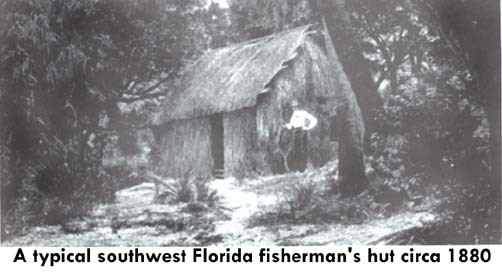 The entire southwest part of Florida, Fort Myers southward, was used for fishing since its discovery. Cubans, Indians and Americans fished and traded more or less in harmony until political differences disrupted the rapport. The Second Seminole War was probably the largest disruption. Fort Myers as a fort or community did not exist until 1850. During the Seminole War it was Fort Dulany and was completely destroyed by a hurricane on October 19, 1841. It was rebuilt on higher ground up river. General David Twiggs ordered the fort rebuilt in 1850 and his daughter was married to Florida chief quartermaster, Colonel Abraham Myers. As an honor to both of them the fort was named Fort Myers. With a population of 349, Fort Myers voted to incorporate in August 1885, becoming Monroe County's second city. However, its only school, the Fort Myers' Academy, burned in May 1886. The story goes that Monroe County was miffed at them for letting the $1,000 school burn and put off building another one until later. The next year the big cattlemen of the area pushed through a bill creating Lee County on May 2, 1887. It included all of today's Lee, Collier and Hendry Counties. One of the few incidences of a "tree claim" in Florida could have occurred at Cape Sable in the 1884 claims for the (James A.) Waddell Coconut Grove. This 1,120 acre grove of trees dominated the water front for years to come. The Tree Claim Act of 1872 was meant to entice tree planting in the treeless Great Plains of America. James Waddell became mayor of Key West in 1895-97. Chokoloskee was settled in the 1870s. In 1891, Charles McKinney opened a post office named 'Comfort' at Chokoloskee. At the time it was incorrectly listed under Monroe County as it was really a few hundred feet in Lee County. Remember Lee County was created in 1887. Also incorrectly listed as Monroe County was the Everglade Post office opened by George Storter on July 19, 1893. Earlier Storter had bought the land that is now Everglades City in 1889 from William Smith Allen who was from Key West and who had settled there in 1870 to grow vegetables. Another 1893 post office that was actually in Monroe County was at Flamingo. The postmaster was Howell Low named on December 30, 1893. Duncan Brady, a new Englander bringing pineapple slips to Upper Matecumbe Key, sailed westward and was one of the first Flamingo settlers in 1892. Cape Sable followed with a post office on February 23, 1904. Flamingo reached its peak of prosperity a few years later. By 1900 about 50 families lived there and there was a Monroe County school. Other popular family names were the Irwins, Roberts, and Douthits. Farming, charcoal making and plume hunting were the area's economy. But it was plume hunting that brought the people and its name Flamingo. Audubon warden Guy Bradley (not to be confused with Brady above) was murdered in 1905 by outlaw plume hunters. Public rage over the murder and the pluming practice created the 1910 Plumage Bill which outlawed the practice. By 1910 only three houses remained occupied. Flamingo also supported commercial gill net fishing until it also was outlawed. 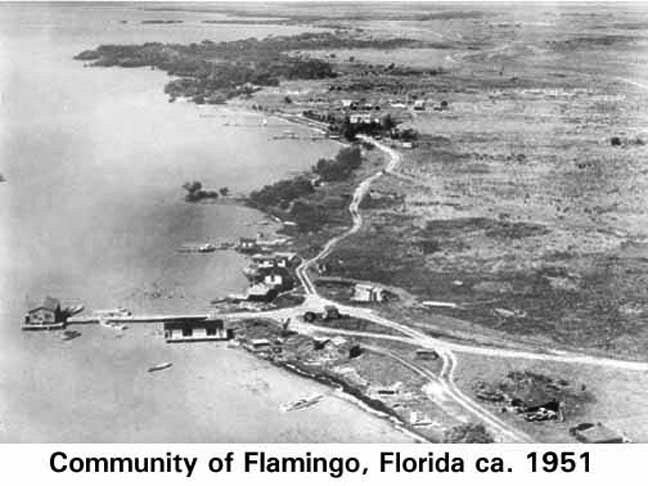 When the Everglades National Park was created in 1947, Flamingo became a part of the park. Henry Flagler announced in 1905 that indeed the Key West railroad Extension would be built. Many figures exist of how much he spent, but the important thing is, it was built. Some will even argue that. Under the web site's general history there is a page for Henry Flagler. Railroad construction was begun at many points throughout the Keys, not just from the two ends. However, the track was laid from Homestead, Florida southward. The intermediate goal was the construction of and to Knight's Key Dock. This was a small wooden city about one and a half miles out in Moser Channel south of present day Marathon. Daily train and passenger ship service began in 1908 to Knight's Key Dock. The community on Key Vaca soon became known as Marathon. Many Keys communities received names by given be railroad personnel. It seems that what ever name the depot bore, the name continued. Major challenges still faced the railroad's completion to Key West. The largest being the Seven Mile Bridge and next was the Bahia Honda Bridge. Hurricanes in 1909 and 1910 made these even greater challenges. What many thought could not be done was done when Henry Flagler rode the first passenger train into Key West on January 22, 1912. Key West was tied to the mainland by two thin ribbons of steel track. The advent of the railroad would appear to have been the absolute solution for the farming industry in the Keys - faster and daily transportation. However, that was not the way it was. The hurricanes of 1906 and 1909 did severe soil and property damage throughout the pineapple growing Keys. A blight also damaged the crop of 1909 and subsequent crops. The railroad, to add insult to injury, placed a smaller tariff on imported pineapples, so pineapples as an industry went the way of wrecking. However, the infrastructure for growth was in place. The key lime made an appearance with an attempt to replace the pineapple, but it also was not to endure. It is now the 1920's and the land was worth more as a subdivision than a farm. Related railroad work and the tourist industry began to emerge. Between 1925 and 1927 there were 25 subdivisions platted on Key Largo alone, and all platted by outsiders. The land boom busted and Key Largo did not have another new subdivision until 1940. The land boom effects were a little more obvious on Key Largo because of its nearness to Miami, but it was echoed down the chain of islands. Without a doubt the railroad induced a major change of lifestyle in the Keys. Flagler's railroad depots created place names like Jewfish, Key Largo, Rock Harbor, Tavernier, Islamorada, Matecumbe, Long Key, Marathon, Pigeon Key, Spanish Harbor, Big Pine, Cudjoe, Sugarloaf, Chase and Boca Chica. Most survived, but some did not. Block ice and daily mail service was commonplace. The Lower Keys were attractive to sponging. Charles and George Chase formed The Florida Keys Sponge and Fruit Company in 1910. In the 1880s, Jeremy Fogerty and Ralph Munroe had experimented with artificial sponge cultivation. In 1897, the legislature passed laws protecting private sponge beds from poachers. The Chase brothers purchased the Dr. J. Vining Harris' Sugarloaf Key holdings and went into business cultivating sponge beds. A mini-manufacturing community evolved and after the railroad's arrival the community grew to around 100 inhabitants. The community sported the sponge buildings, a post office, store, railroad depot, telephone and an ice plant. In the railroad timetables, Chase was posted at mile marker 506. The F.E.C. railway listed their stops in miles from Jacksonville, Jacksonville being zero. What was lacking for Chase was law-enforcement as poachers could clean out a year's worth of sponge growth quickly. In 1917 the Chase brothers declared bankruptcy and the assets were sold to R. C. Perky. Richter C. Perky probably controlled more land in the Keys than any other person at the time. Much of his land was on Key Largo in grapefruit, but Sugarloaf Key was to be a vacation spot. Perky also undertook sponge cultivation but he is better remembered for the 50-foot bat tower built in 1929. Perky could have been Monroe County's first mosquito control, but the bats did not come to roost, however the sponge poachers did. Enforcement of the law against poachers proved useless. Perky died in 1940 and the Perky Bat Tower, even without maintenance, still stands tall weathering all subsequent hurricanes. In 1923, Big Pine Key was the scene of another possible new Keys maritime industry. Increased uses of shark oil sparked Hydenoil Products to build a shark oil plant on Big Pine's Atlantic shore. The plant geared up and employed 25 men and operated six fishing boats. From appearances all was well as by 1930 they caught and processed an average of 100 sharks daily. They expanded the size of the plant, but workers began to quit as the company was skipping paydays. Finally, in 1931 it closed for good when the manager complained of being owed $3,000. When WW-II shut off the US supply of cod liver oil, other smaller shark oil plants were attempted on other Keys, but they too were short lived. While the artificial sponge cultivation and shark processing plant were struggling, Monroe County sensed the need for a vehicle highway. It began in 1925 but the hurricane of 1926 delayed completion in the Upper Keys. 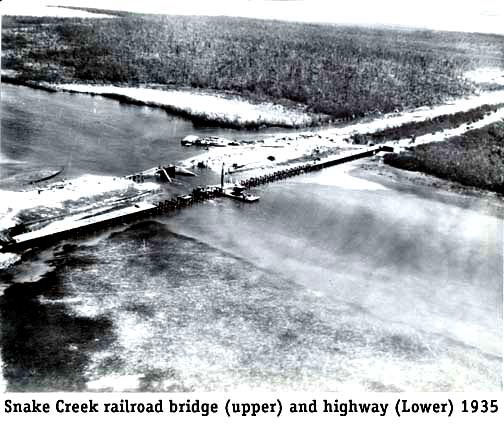 Then in 1928 a highway connected the Keys to the mainland via a bridge across Card Sound and 40-miles of ferry service. The railroad had provided most Keys communities with mail service, daily ice, as well as other things that efficient transportation can provide. The highway provided better day-to-day services with buses, delivery trucks, day trips, etc. One change appeared to be alternative life styles. Farming was still present, but there were now other choices, and perhaps not as demanding. Farmers and fishermen alike became fishing guides and operators of mercantiles, service stations, restaurants, etc. Hand painted signs appeared along the highway advertising services. Recreational centers appeared as the Long Key Fishing Club, the Anglers Club, the Caribbee Colony, the Marathon Yacht Club, Big Pine Inn, Pirates Cove and others. Key West did not fare as well. For one thing the nation was entering a depression. The military moved out, the cigar industry was moving to Tampa, the sponge headquarters moved to Tarpon Springs, maritime freight and port-of-call business was being diverted to new ports. Key West barely grew at all. For that matter, there was little population increase on the other islands, but there was change. 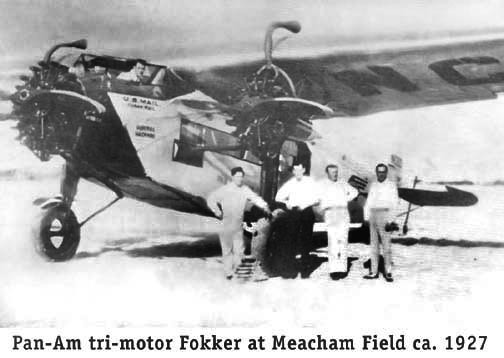 Since 1919 Key West and Cuba had been playing with air transportation. In the early 1920s, Aero Marine West Indies used seaplanes for air travel. Pan American Airways jumped in with two planes in 1927. Even though the depression was on, Pan Am established scheduled service between Key West and Miami in 1934. The highway was just in time for the 1929 stock market crash. The 1930s brought The Great Depression which had severe effects on Key West. The tourists and associated building of the 1920s evaporated. This was followed by the Navy reducing its base to maintenance status in 1932. Only the radio station remained in full operation. Cigarettes replaced cigars and a disease threatened the local sponge activity. On July 1, 1934 Key West officially declared insolvency and threw itself into the hands of the state. The state was no better off than Key West and neither was the country. So it was up to President Franklin Roosevelt and his New Deal programs with acronyms like the CWA, WPA, PWA, CCC, and FERA. Julius Stone headed the Florida division of the Federal Emergency Relief Administration (FERA) in Jacksonville, and he found special favor in Key West. It appears that he spent more time in Key West than all the rest of Florida, and Key West reaped the benefits. Many work programs were started and continued throughout the Works Progress Administration (WPA) period. The remainder of the Keys were struggling more or less for themselves, but they were not dependent on the military, cigar making and sponges. 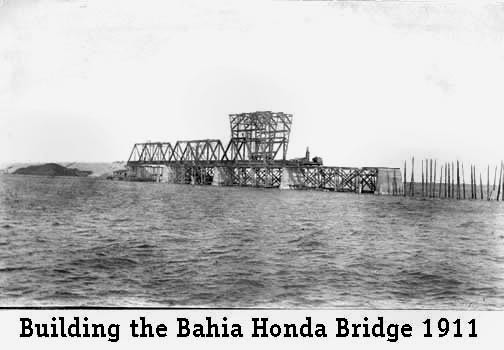 In the Upper Keys three camps of World War I veterans were brought in to build a bridge network to replace the inefficient and unreliable ferry system where there was no highway. Vehicle ferry boats ran between Lower Matecumbe and Grassy Key, and Marathon and No Name Key. Bridge building began in November, 1934, but it was for naught. On September 2, 1935, the most powerful hurricane ever recorded over the North American continent struck the Upper Keys. Forty miles of railroad were washed away but the concrete bridges remained intact. Hundreds of veterans and their families drowned. Entire civilian families were decimated. Nothing but wreckage remained from Plantation Key to Long Key. Points south of Windley Key had only maritime and aircraft transportation service. Key West was partially isolated just as it was getting back on its feet. However, it had been shown the way to success - tourism. Reportedly, the train had brought 17,000 passengers to Key West the winter before. New ferries were brought in and the ferry landings rebuilt. Transportation was once again normal, minus a railroad. The concrete railroad bridges were not damaged, just the filled roadbed in between. People with savvy and vision took the reins and a federally backed loan for $3.6 million was obtained. The railroad's right-of-way was purchased, bridges widened and converted for vehicles and a connecting highway built. With a lot of hard work it was completed and a convoy of thousands of automobiles drove to Key West in late March 1938. Visitors, delivery trucks and buses frequented all the principal Keys. Time moved on and as World War II loomed on the horizon, the Navy began a build up in preparation. When war did happen, the naval operations envisioned for Key West necessitated corresponding logistic support. This was the precursor of modernizing the Keys. Nothing much changed for mainland Monroe County. A modern military force required sufficient drinking water, electricity and an efficient highway, and that is what all the Keys received. These three almost necessities for modern families laid the framework for growth in the Lower, Middle and Upper Keys. Of course, the war had to end and families get back together, but that just took time. Within a decade there were high schools in Marathon and Plantation; new church groups never in the Keys before had meeting places. Large developments like Ocean Reef, Layton and Key Colony Beach crept in. Digressing back to the WW-II period, major progress was made for all of Monroe County in 1942 with the water pipeline and a rural electric system. The Overseas Highway was improved and shortened by 17 miles along today's route. This action by-passed the ocean route through Pirates Cove in the Lower Keys and the wooden Card Sound bridge in the Upper Keys. In other words, the vehicle route was more or less as U.S. 1 is today. It can safely be stated that 90% of the permanent population resided in Key West, but this was about to change. I will stick out my neck and say that the main thrust were retirees, but many were retirees that did not remain retired. After WW II, the whole country increased in mobility. Motels increased to the extent that motel laws were passed. The Upper Keys began to grow again. First there was a weekend physician, Dr. Tallman, followed by a resident physician Dr. Cohn, thanks to Nurse Frances Tracy. On November 11, 1950, the voters of Monroe in my opinion made a huge decision. The voters voted overwhelmingly to approve an anti-mosquito district - 1781 for and 170 against. I am certain this was one of the elements that sustained the huge Upper Keys building boom that began in the 1950s. The opening of a high school was another reason. There had been efforts to control mosquitoes ever since Dr. Walter Reed announced mosquitos as disease carriers. Actually, a Cuban doctor had done so earlier, but Dr. Reed received the credit. Drainage was the primary attack weapon and the U.S. Navy pursued this vigorously. In November 1935, the F.E.R.A. appointed A.C. Tanner to develop an anti-mosquito program in Key West and the W.P.A., a sister federal agency to FERA, joined in. A few years later R.C. Perky built his unsuccessful bat tower on Sugarloaf Key. Bats eat mosquitos and had there been significant bats, the bats could have diminished the number of mosquitos. How significant the reductions would have been is questionable, but the project was unsuccessful. World War II had a byproduct called DDT which became the chemical of choice for mosquito control and later prohibited. Meanwhile, they continued to battle the countries polio epidemic. In October 1953 there were a total of 51 cases in Monroe County. In 1954, the Monroe County contributions to the polio March of Dimes was the highest in the state. Irregularities in the controll of revenues for the Overseas Highway Toll was discoveries and the toll was removed. Marathon gained a full time lawyer, physician, dentist, fire department, etc. Very important for the Middle Keys, the Seneys incorporated the Keynoter newspaper. 1951 saw a permanent Highway Patrol station built in Marathon and two years later in January 1953 the first water meter was installed in Marathon. In the Upper Keys, the two-room schools became overcrowded. The newly built Coral Shores High School graduated its first class in 1953. New churches sprang into life. Mosquito control was put into effect as a county agency in 1951. At first it was spraying with trucks, but by 1960 the Beech type 18 aircraft was used. All the elements for growth were falling in place. Another 1950 event was Southern Bell installing dial telephone service for Marathon. Matecumbe and Key Largo. Each customer had a four digit number. My 1951 copy was a Matecumbe book and the rates were to call Key Largo on weekdays $0.23, Marathon 0.35, Key West $0.60 and Miami $0.60. The number of listings were: Key Largo = 124, Matecumbe = 147 and Marathon = 157. On the mainland, the Everglades National Park obtained 1,076,552 acres of Monroe County for public use in 1947. Originally the park was planned to extend across Key Largo into the Atlantic Ocean. Monroe County prevailed by withdrawing Key Largo from the park. Therefore, the park's eastern boundary runs a few miles off the western shore of Key Largo. On Big Pine Key, 22 new subdivisions were platted. However, this was followed by Congress passing bill HR-1058 in 1957 creating a National Wildlife Refuge for the deer. Business was good around Big Pine Key and the Lower Keys Chamber of Commerce established its office on Big Pine in 1959. Big Pine was well on its way to becoming self supportive with its own economy and stores. A side note on growth, from the Key West Citizen newspaper, in 1947 Dun and Bradstreet revealed 269 businesses in Monroe County. Then in 1953, Dun and Bradstreet revealed that Monroe County had 507 businesses. The was a 88 percent growth over a six year period. There is little doubt that the addition of rural electricity, public potable water, and the improved and shortened highway during WW-II followed by the post WW-II prosperity and change of public attitude, coupled with mosquito control, and an Upper Keys high school jump-started growth. I wish I had other Dun and Bradstreet numbers to share with you. Anyway, in 1954 the Casa Marina Hotel in Key West announced that it would be open year round. Construction began to extend the Meacham Field runway by 600-feet. The average spendable household income in Key West was $8,518 compared to the national average of $5,246. Sheriff Spottswood also his jail was almost at capacity. Signs of growth was almost everywhere. Another sign of growth in the Upper Keys was in 1958 when a green and white sheriffs substation was opened on Plantation Key. It was no longer necessary to call the Marathon Highway Patrol, or the sheriff in Key West, in emergencies. Prisoners no longer had to be taken to Key West. The county's growth finally forced the Monroe County Commission to meet outside of Key West, even though official business still had to be conducted in Key West. It did just this under Mayor Harry Harris in March 1971 in the 3rd District Justice of the Peace courtroom on Plantation Key. The commissioners debated a bill to hire a county administrator as the 200 county employees were being governed directly by the five political commissioners. It was thought that a good administrator could be hired for less than $30,000 a year and the ordinance was approved in March 1976. The year before this, on April 15, 1975, the Florida Keys were declared an Area of Critical State Concern. Therein was the basis for guiding the development of the Keys. A Comprehensive Master Plan was eventually approved and a Rate of Growth Ordinance (ROGO) implemented. The creation of the Conch Republic in 1982 while based on actual occurrences was in actuality more pomp and publicity than government. A roadblock was set up at the junction of U.S. 1 and Card Sound road, just south of Florida City in Dade County, at the on April 18, 1982 by U.S. Border Patrol. Their purpose was to search for illegal aliens and drugs, both which had proliferated in Monroe County. These roadblocks caused traffic leaving Monroe county to block up sometimes, but rarely, for hours (the first day was a problem). Key West community and tourism leaders concerned over the impact on tourism announced the formation of the Conch Republic with a mock secession from the Union. Emotions ran high, but Federal Judge Clyde Atkins refused to issue even a temporary restraining order to end the checkpoint. Conch Republic officers were appointed, passports for sale, radio stations played "Send in the Clowns", the 74-foot schooner Wolf proclaimed the flagship, a hymn of the Conch Republic written, the Key West flag adopted and many other national symbols enacted. In the end some 50 illegal aliens and about 50 pounds of marijuana were seized. The aforementioned growth also necessitated additional county government. A few of the larger additions were the Jackson Square courthouse in 1986. In 1993, a Marathon Government Center was opened on the site of the old Clark estate. This was followed by a new County jail on Stock Island in 1994 and an adjacent new sheriff's office in 1995. However, an election for a special taxing district bond for Conch, Duck and Grassy Keys for new fire fighting equipment ended in a tie of 60-60. The bond issue was defeated by the "luck of the draw" of a lot required by Florida Law in cases of a tie vote. The importance of one vote appeared once again in the county commissioner election of Allison Fahrer and Henry Rosenthal. Mrs. Fahrer won by one vote. The importance of registering and then turning out to vote cannot be over emphased in Monroe County. In general numbers, since 1950 Key West maintained a population oscillating around 30,000 residents depending on how the military and their dependents were counted. Key West had grown steadily until after the arrival of the railroad in 1912, then dropped off some until WW-II and shot up to over 35,000 during the Cuban missile crisis in 1963. In June 1973 Destroyer Squadron 18 and Submarine Squadron 12 were decommissioned and the U.S. Navy began withdrawing. The Key West population decreased to the present more or less stabilized number; however, the Upper Keys continued to gain population despite growth controls. UPPER KEYS Division: Key Largo = 11,336, Tavernier = 2,433, Plantation Key = 4,054 and other parts = 2,662. MIDDLE KEYS Division: Marathon = 8,857, City of Key Colony Beach = 977, City of Layton = 183 and other parts = 2,775. LOWER KEYS Division: Big Pine Key = 4,206, Cudjoe = 1,714 and other parts = 4,495. KEY WEST Division: City of Key West = 24,832, Stock Island = 3,616, Big Coppitt = 2,388 and other parts = 1,646. CAPE SABLE Division: = Cape Sable and off shore islands = 292. For decades the unincorporated Keys population hovered at less than 2,000 total. There was a small peak in the 1912 time period. At the end of WW-II and influenced by a better highway, public water and electricity, their population increased to around 3,500 by 1950. With population mobility, schools, churches, etc., the unincorporated population then spiraled to about 50,000 in 1990 representing about a 1,300 percent growth in forty years. Of course two communities have recently incorporated reducing this figure. <> Much about the above settlements, industries and development is presented in other web pages along with discussions of the people behind them. Today, Monroe County, the county of islands, is struggling under the growth restraints of its Land Use Plan for the year 2010. The principal economy is tourism followed by retail services, commercial fishing and government employment. Exactly where transfer payments to the retired community is debatable. Plans are under way to turn over road responsibility on the mainland to the federal government. Frequents discussions center around if the carrying capacity of the Florida Keys has been exceeded. Under consideration is a protocol for central sewer systems on significantly inhabited Keys. Special legislation has created an Independent Wastewater District for the island of Key Largo. A site for a new Key Largo government center is in progress. There is talk of incorporating or annexing Stock Island. The sounds of silence are gone.